Wheels on the ice are a common sight in rinks up and down the country these days. 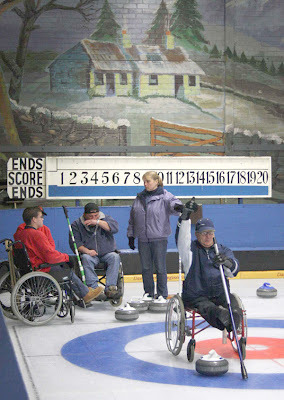 Lockerbie Wheelchair Curling Club has a regular session each week, and some new recruits were on the ice at the South of Scotland rink last night. Area Development Officer Marion Murdoch is the driving force. 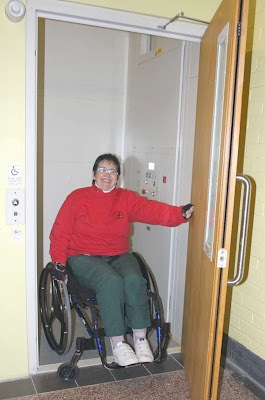 The reason for this post is to highlight the rink's new lift, to allow disabled access to the bar and viewing area. The lift was installed as part of the recently completed rink improvements (story here), part funded by sportscotland. A new refrigeration plant and rink lighting were installed over the summer. 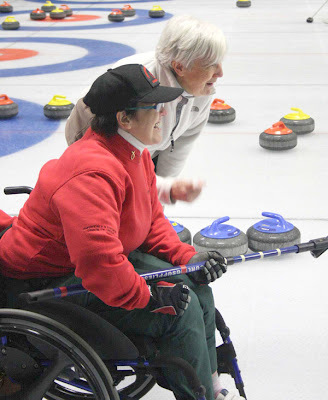 This is Mary Bell, a member of the Lockerbie Wheelchair Curling Club. Mary on the ice with helper Ilene Broatch. It is always encouraging to read of improvements like this. 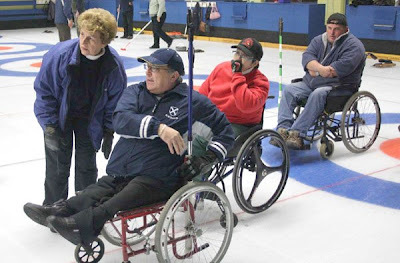 I have helped coach wheelchair curling for the past 4 years at the Ogden Legion Curling Club in Calgary, Alberta Canada, and we have seen the Legion come up with similar improvements to the lift,adding power doors, doorway ramps and a ramp to the ice area. It is always wonderful when you find a "home aeay from home" like these 2 facilities.